« Siesta Scripture Memory Team 2015: Verse 10! 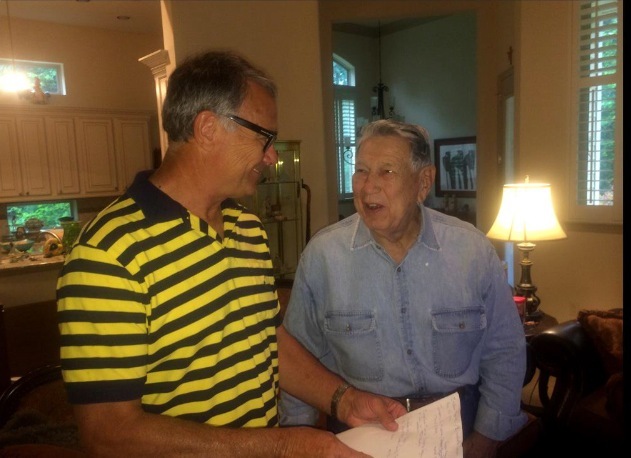 On Monday night, May 18, 2015, the Lord swept Marcell “John” Moore, the dearly loved patriarch of our family, to Heaven, after he’d overcome enormous health challenges for years, valiantly cheating death again and again. We are blessed beyond words that he fought courageously to live against all odds and we count dear every moment we had with him. After a number of hospitalizations over the previous year, we are deeply grateful to God that John was home, surrounded by family in the days and hours leading to his passing and at the time he took his last breath. A man has never been more loved by his family than John Moore and due, in such large part, because he taught us well and loved us well. The great affection he fostered among us kept us all close, living life together and laughing, particularly at him. He was the star of the family and could hold the floor like no one else. We were audience to continual stories and anecdotes retold with tremendous color, flair, and no little exaggeration. None of us has to wonder how he felt about us. We were told often how much he loved us. His is a household name in Houston, Texas. Down any freeway in this city, you can still see the words “Call John and Get Moore” on plumbing trucks and most Houston residents could sing the jingle from the commercial in a heartbeat. He started John Moore Plumbing Company in 1965 with one set of tools in the back of a black van on Vogue Lane and, in his tenure, the company serviced 750,000 homes. The company was sold in 2004 but not until he’d managed to mark the plumbing industry in Houston with a gentleman’s handsome face and winsome way. His hospital room and home were graced continually by countless friends and business associates. Born in Houston on January 8, 1934 to Marcell John Moore “Red” and Mary Moore, John loved this city and never lived a moment of his life outside the area. He leaves behind his wife of 62 years, Mary “Sue” Pereira Moore, whom he adored and constantly called “my bride.” Perhaps nothing conveys how lovely she was to him like the fact that he did not feel nearly so called to become a Catholic priest once he set his sights on her. Needless to say, his change in vocation from future priest to future king of plumbing is one to which we – his children – owe considerable thanks. Alongside his wife, John was a devoted Catholic and his faith in Jesus Christ grew dearer and dearer to him. They were members of Saint Elizabeth Ann Seton Catholic Church in Houston for many years then, after moving to the country beside their son and daughter-in-law, they became members of Saint Anne Catholic Church in Tomball, Texas. He was preceded in death by his brothers Ronnie Moore and Pat Moore and leaves behind one sister, Etta Heemer. John and Mary’s two beloved children, Marcell John Moore III (“Duke”) and Nalda Jean Moore Presnell each preceded him in death. Our consolation in the loss of a family man we can never replace is that he holds the two of them in his arms this very moment. Left to recount endless stories about him are his son, Keith Moore and his daughter-in-law Beth Moore of Tomball, Texas, his daughter Tina Moore Carroll and his son-in-law John Carroll of the Woodlands, Texas, and his daughter Mary Moore Meadows and his son-in-law Mike Meadows of Waco, Texas. If it sounds like from our locations that leaving Texas would have been an almost unpardonable sin, we say with a grin that perhaps, then, you understand our family. We stick close. And we are so glad he insisted on it. John had no greater joy in his life than his six grandchildren, all of whom adored him. Tearful farewells were said to him by Amanda Moore Jones and her husband, Rev. Curtis Jones, Melissa Moore, Ben Meadows, Joe Meadows and his wife, Chauntell, John Taylor Carroll, and Hannah Carroll. Their tremendous attentiveness and help to their grandfather and grandmother enabled Hospice to oversee his care but primarily and confidently leave John in the hands of his family until the Lord took him home. John also had the privilege to love and be active in the lives of his two great-grandchildren, Jackson (9) and Annabeth Jones (6). He ended his life here having the joy and satisfaction of knowing that two more great grandchildren would be born into our family this year. We have smiled saying that God knew it would take the addition of two people to comfort us in the loss of the one big personality we will miss deeply. We are grateful for the doctors and the nurses at Tomball Regional Hospital who knew him well from his many visits and loved him. We are also inexpressibly grateful for the last four years of his life spent in the fresh air of the country where he sat atop every conceivable John Deere on wheels and ruled the roost. These woods and neighbors will never forget him. We don’t plan to let them. This is one of my favorites because it captures both Keith and his dad’s expressions when Keith shows him a document that proves their ancestors were in Texas while it was still a Republic. 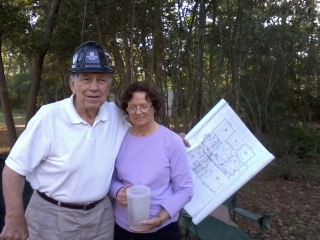 This one doesn’t show what a lovely woman Keith’s mother is but I had to include it because this is Big Pops taking completely over when we built our two houses out in woods so thick with vines and brush that we had to hack our way into it. He was in his absolute element overseeing the development of the houses and yards and water wells. Here with his blueprints. Here he is with our Jackson not long after we moved in. We four generations were so blessed to do a tremendous amount of life together. 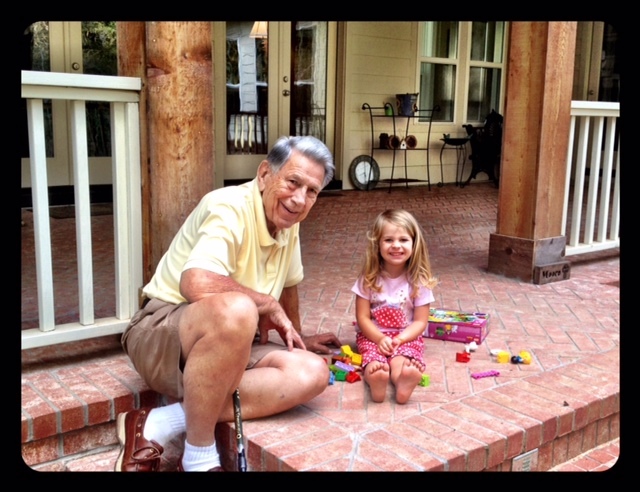 Not many kids get to know their great grandparents as well as Jackson and Annabeth did. We consider it a gift beyond price. 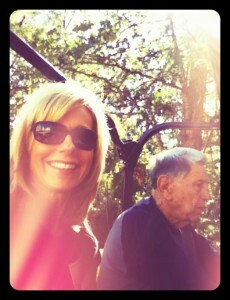 With me on the gator. He took a gator ride seriously. The first two years we lived in the woods were dream years for us with him. His health stayed pretty stable and, as he had a natural God-given inclination to do, he ran the place. And we let him. He never got off the saddle of some kind of John Deere. I love this one so much because it shows him a bit younger. This is Amanda with both her grandparents at her wedding. You can see what a beautiful woman Keith’s mom is in this picture. Not to mention that first grandchild in that wedding dress. These next two are very recent. Big Pops with Melissa. Good grief, he was crazy about her. 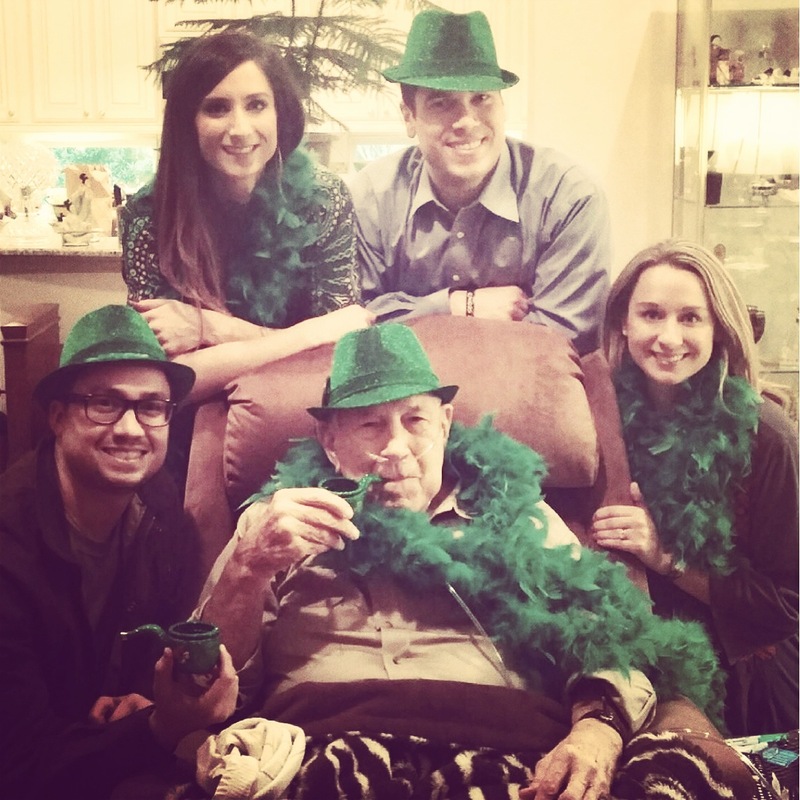 He loved his six grandkids to no end. Amanda and Melissa were his first two. This last one is not the greatest picture but it is a classic. Amanda, the eldest grandchild, had the foresight to plan an evening for the grandkids to come over to his house and celebrate him. Lover of Ireland that he was, she chose St. Patrick’s Day, his all-time favorite. We knew he wouldn’t be with us for long. He was nearly on his deathbed even then. 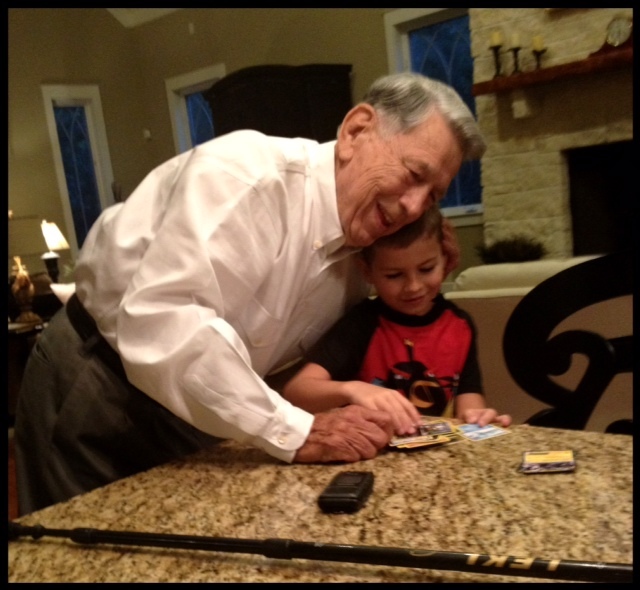 The grandkids told him their favorite memories with him and he reciprocated with stories of his own. It was the greatest night. We laughed our heads off and partied to high heaven. The only sad part is that two of the grandkids were missing with the flu. I hate that they weren’t part of this night. We will remember it forever. Ben (top) and Joe (left) Meadows, the young guys in this picture, are two of the finest young men I have ever known. The tender care these two gave their grandfather in his last days and hours and countless previous times was just astounding. They spent night after night in the hospital and at his home, holding his hand and tending to every conceivable need. Joe is a paramedic and he single-handedly enabled us to take care of our loved one with a minimum amount of oversight from Hospice over the last forty-eight hours. It was just family. A tremendously sacred time. Thank you so much for indulging us. People process grief different ways. I mostly write. Well, and of late, play hymns on my new antique piano. I’ve never been more grief stricken over losing someone of such advanced years, even knowing it was coming. He was just such a force in our family. Such a wonderful handful of a man. He could be the biggest mess. So much fun. And he was good and ornery. Just one of those kinds of people who can never be replaced. I feel like a gigantic meteor hurled straight through these woods and left a huge, gaping hole. 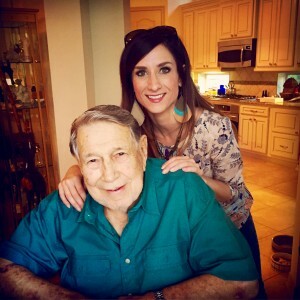 I had the privilege to be loved like a blood daughter to my father-in-law. Thirty-six years is some substantial bonding and, what it doesn’t provide, living right next door does. He told me continually how much he loved me. I would not have traded this exact father-in-law for all the stellar dads in the world. I will miss him every single day. This entry was posted on Wednesday, May 20th, 2015 at 11:28 am	and is filed under Uncategorized. You can follow any responses to this entry through the RSS 2.0 feed. You can skip to the end and leave a response. Pinging is currently not allowed. I am so sorry for your loss. What a lasting legacy this special man left. I’m praying that God will wrap His loving arms around you, hold you close and bring the comfort that only He can provide. It has been said so well by so many others here, but I had to get on and tell you how sorry I am for your family’s loss. Your father-in-law sounds like a man of great character and personality as well as love and affection. I’ll send up a prayer for the Moores whenever you come to my mind, asking God to fill you with His peace and comfort and strength. You love us all so well and we share in your pain during this sad, sad time. Oh, Beth, such a precious tribute to your father-in-law!! So touching and brought tears to my eyes. I once again read this beautiful post and it made me cry. I have wept and prayed for you and your family as you have all endured this loss. But my tears today are for another reason. Mr. Moore was surely a man of great heart and great honor. A priceless jewel that everyone who has known him I’m sure they are glad that he crossed their path. A truly good man of such treasure is hard to find. I write this because I am feeling bruised today by a man who has been pursuing me, may have just shown his true colors. He may have just turned out to be a wolf, he the predator, me the prey. I am thankful for the protection of God. But also thankful as this testimony shows that there are wonderful men who as this man has done are just living out their beautiful purpose and he obviously lived it out so well. Thanks again for sharing this Beth. I dearly love you. Mary G.
Our heartfelt condolences to you and all your family, Beth. I don’t know your father-in-law but after reading the obituary, I felt I had known him. I feel your heart at the loss of your father-in-law. I, too, lost mine 4 years ago. I will never forget him. Like yours, my father-in-law welcomed me and loved me and called me the daughter she never had (having only two sons). Father-in-law like them are the hall of farmers in our hearts. You and your family. What a wonderful legacy he left behind. What a comfort to know he is at home with the Lord. I have been praying for you often as the Lord has brought you to my mind, that He along with His comfort and peace He will heal all your broken hearts and fill all those empty places right now with his overflowing love. God bless you all. I’m so sorry for your loss. Praying for your family during this time of grief. Praying for your family during this difficult time. My Papaw went home to be with the Lord 4 four years ago. His illness was brief, thank the Lord and we had our time to tell him “See you again”. Those were precious memories that I will cherish the rest of my life. Thank you for sharing a few memories of Big Pops. I loved the stories that you told about him in Bible studies, and I know that they are even more precious now. My heart goes out to you and I pray that God continues to give you joy in your memories and comfort in His loving arms. So thankful you know you’ll see John again one day! Also praying you are all safe from the floods in Texas. God be with you and keep you safe! So sorry to hear of your recent loss. His legacy carries on in his children and grandchildren. Sounds like he definitely left a mark on lives he touched. Praying for strength and God’s peace to cover you and your family. Love you. i have studied with you a long time and have learned much about your family. I just finished “Children of the Day” and learned about your homes next to each other and the garden you shared. It reminded me how much my Daddy (also named John) loved to be in his garden and share the abundance of tomatoes, cucumbers and whatever else he planted with the neighborhood. The canning was hard work, but eating the food in those jars was great during the winter. Losing a beloved family member isn’t easy, a broken heart doesn’t mend quickly, if ever. When each of my parents passed the only thing that soothed my sorrow was knowing they were with my precious Savior. I await, with anticipation, for Jesus to return and live with Him together forever. But in the meantime I try to live the way they raised me, loving and serving the Lord with all my heart, soul and mind. Thank you for sharing John with the rest of us. You and your family are in my prayers during this time of sorrow. How blessed you all were to have such a man in your life. I will say a special prayer for all of you tonight. What a loving tribute. Much love to you and your family at this sad time, dear Beth. Yes, I remember seeing those plumbing trucks every now and then during the 8.5 years that I lived in Houston! I wondered for a little while if it was Keith’s father’s business. Then, after starting to do Bible studies with dear Miss Beth, I recall hearing her talk about his business once in a while. It is a bit amusing that he sold his business the same year that the Lord called me to move back to my home town, in southern Wisconsin; in order to be with my aging parents. Mr. Moore was born exactly 4 years after my Dad, and 4 years before my Mom was born. 🙂 Now, he will get to meet both of them in Heaven. I am so sorry for your deep loss. My Mom had her 2nd “anniversary” in Heaven this past March; and my Dad interestingly “celebrated his 7th anniversary” in Heaven exactly 4 days before my Mom did. He oddly (or by God’s plan) passed away exactly 5 years, and 4 days before my Mom. So, even though it has been 2 years since my Mom’s passing; my sister’s, cousins, and I, still miss her deeply, as well as my Dad. It has been a rough road for all of us, as that kind of unconditional love given by my parents, like what you described about Mr. Moore; will stay with us for the rest of our earthly days. However, it also makes it that much more difficult in the grieving process for me. So, know that although they are completely different people; I feel as if they had much in common, including their being Catholic Christians! Let me pray for Y’all, even though I am not very good at it quite yet. Psalm 23 is for those who are ALIVE, as well as for those whom have gone before us to meet You in Heaven. Comfort them, LORD, with Your Love, Peace, and Strength, that Only You can provide to them now. Remind them that, as the song, “Strong Enough” says, that the strength that comes to them at this difficult time is Your being “strong enough for both of us”. It’s author is Matthew West. This song still helps me in my grieving process. It is called “On Eagle’s Wings”, which I learned as a junior high student, in my former Catholic church. It resonates with Your Holy Spirit, inside of me, Lord Jesus, every day. I believe the lyrics come mainly from Psalm 91, and Isaiah 40:31. May all of these lyrics touch each one of your hearts. The chorus is as follows: “And, He will raise you up on Eagle’s Wings, bear you on the breath of dawn; make you to shine like the sun, and hold you in the Palm of His Hand”. Another verse of this song is very meaningful, too. “You who dwell in the shelter of the Lord, who abide in His shadow for life, say to the Lord, ‘My Refuge, My Rock in Whom I Trust. '” It’s original author is Fr. Michael Joncas. Another song from my childhood, is called “Yahweh, I Know You are Near”; and it’s lyrics are very touching, and comes from Psalm 139. It’s chorus’ lyrics are: “Yahweh, I know You are near, standing always at my side; You guard me from the foe, and You lead me in ways everlasting.” It’s author is Dan Schutte. And, from Psalm 121: I lift up my eyes to the mountains — where does my help come from? My help comes from the LORD, the Maker of Heaven and Earth. May each of you feel His Presence during this very difficult time. Oh Beth, I am sorry sorry for your loss. I sobbed through your whole post. Love all the pictures and love how your daughters stepped up and made these last days so memorable for you all. My family and I have bee through this as well. I love you Beth. My heart hurts for your family. Praying for yall, sweet Beth! Beth, it was wonderful to hear how deeply John Moore loved his family! That is a treasure each one of you will carry with you as you continue this journey of life. Know that you and your family are in my prayers during this transitional time. Beth, Amanda & Melissa: I am just now getting caught up on things I’m far behind on – like my reading. I am so, so sorry to hear of the loss of “Big Pops”. What a lovely tribute to that big personality. It’s hard to lose the people who have loved us and prayed for us over the years. I always wonder: Who will pray for me like that now? I know they can intercede even better from heaven, but I’m selfish enough to want to have them nearby. I am sure, Beth, that you are the big personality in the lives of your grandchildren, the way Big Pops was for Melissa and Amanda. I’d like to hug your necks right now. So much loss and devastation going on even as I write this. We all need “Moore” prayer. Hugs and prayers. What a sweet account of your family’s loved one. 😉 Dave and I send our condolences during this time of loss. 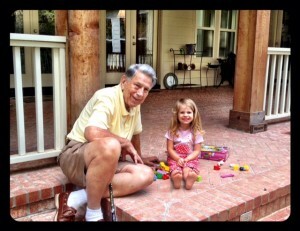 May you find comfort in knowing that your “PAPPAW” is in the arms of our Precious Savior. 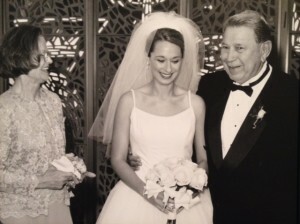 I have often been touched by the stories you share about your family members, but none so much as this tribute to your “Big Pops.” My father was such a man, and your memories bring back to mind so many of my own great experiences with my Pop. These gentle giants hold a special place in our hearts, and always hereafter their memory will bring flooding back to us amazing memories of love lived large despite setbacks and disappointments along the way. What legacies of love they left us! I am praying for your family to never forget any of the treasured moments shared with Big Pops, and that those stories will continue to be shared in your family gatherings until Christ comes again. Peace and comfort to you all at this difficult time. So sorry for your loss. May our God continue to give you and yours His peace, His strength and His comfort that only He is able to give at this heartbreaking time. God bless you always. Dearest Beth and family. Our hearts go out to you. Thank you for sharing this wonderful tribute to your father-in-law. Mine passed very suddenly from this life in 1999 while we were stationed overseas. Your words sounded as if they were describing Bill’s Dad!!! This earthly pain is real but our hope is in heaven. I am praying for you and for your precious family. May God’ s comfort be very present through this time. Dear children, let us not love with words or tongue but with actions and truth. Beth and family, I just now read this as we are traveling in our RV and haven’t been “connected” for a couple of weeks. I pray that you all will be comforted by your precious memories of this wonderful gentleman. 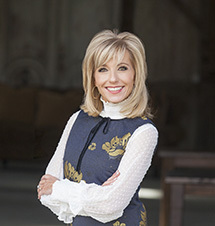 Sheri, Black Diamond, WA: Blessed is the woman who walks not in the counsel of the wicked, nor stands in the way of sinners, nor sits in the seat of scoffers; but her delight is in the law of the LORD, and on His law she meditates day and night. Joining you in prayer and believing Our Father in Heaven will be your strength and love through out this time of loss. My heartfelt prayers for you and your family over the loss of your beloved father in law. No words can give expression to what you are feeling. Your message for the eleventh memory verse brought tears to my eyes as I remember my mom and little dear ones who are waiting for me in heaven. I want to share lyrics of an old hymn penned by Paul Gerhardt. I believe the Lord brought me to this one after the loss of my son. I hope it brings encouragement to whomever reads these lyrics. “Give to the wind your fears; in hope be undismayed; God hears your sighs and counts your tears, God shall lift up your head. To him commit your griefs; Your ways put in his hands- To his sure truth and tender care Who earth and heav’n commands, Who earth and heav’n commands. So sorry for your loss. What a lovely tribute to your father in law. I will say prayers for your family. I lost my Mom last year and my Dad eight yrs earlier. I still miss them dearly. They were my best friends and cant be replaced. What a blessing un your life. What a blessing to read the beautifully written obituary for your wonderful “Big Pops” and the tribute of a life well-lived! Please know of the consolation and comfort of many prayers going up before the throne of grace on behalf of all the Moore family in your time of sorrow and loss. I do apologize this is so late, as we were at the Lake Havasu resort with poor WiFi reception, so had to wait until we got home to get on my desktop and read the obituary and reply in heartfelt sympathy…God bless you all in His comfort and peace is my prayer. So sorry for your loss Beth. What a tribute to your father in law. Thank you for sharing. This is a much needed reminder to me to treasure every moment we have with our loved ones. Praying for peace and comfort, and many happy memories. Wow…what beautiful words, and what a beautiful life he must have lived! That truly touched my heart. I couldn’t stop my tears. I love the scripture you used about God’s hand covering our lives. And describing how precious and sacred a life is to our Father. I feel for the gaping hole he left in the hearts of you Beth and the Moore family. My sincere condolences go out to you. We mourn but not as those without hope. May God grant your family peace and comfort through this time. My deepest condolences on the passing your family member. Thank you for sharing your family memories. You all are in my prayers. God bless you. Thinking of and praying for you and Mr. Keith on your first Father’s Day without your father in law. Really touching! He lived a life worthy of emulation. His legacies are so visible. He’ll ever be remembered for his good works. My mother left the earth for many years. I know, no one can fill my mother’s place. I read the article. John Moore was in a family bond. He’s gone…Praying for peace in your heart. God Bless the Moore Family.